It’s only just over 2 weeks until #30dayswild begins and I’ve been busy preparing! Once again I’ll be blogging about my daily random acts of wildness in June as part of the Wildlife Trust’s #30dayswild campaign. If you haven’t heard about the campaign before you can find out all about it on the Wildlife Trust website. Why not take a look at my blogger profile while you’re there! 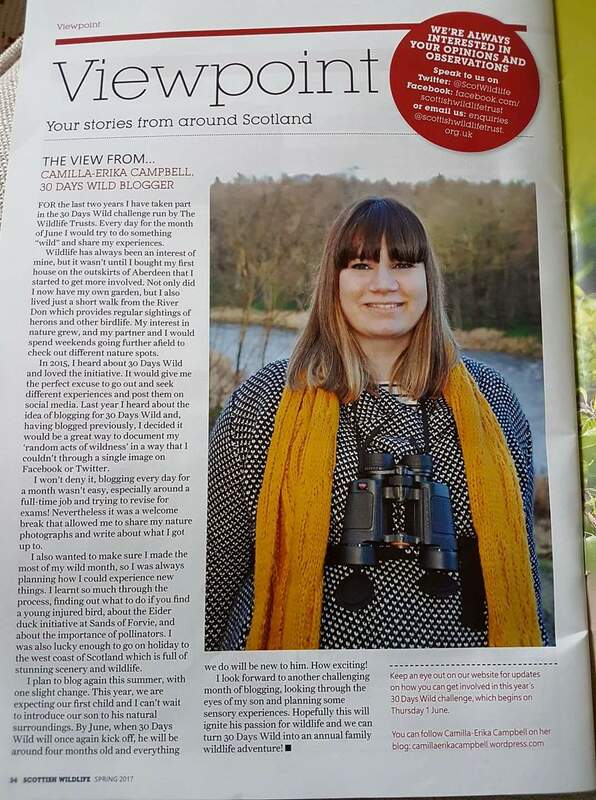 Earlier this year I was approached by the Scottish Wildlife Trust to write about my experience taking part in 30 Days Wild for their magazine. In my article I revealed my plan this year was to focus my blog posts around Robin Oleander (my 3 month old son) and his introduction to the natural world. I couldn’t wait until June to introduce Robin Oleander to the natural world though, we’ve already been exploring a little. Next Post Man Up Camilla and Go to That Baby Group! Super excited for June! Had so much fun with 30 Days Wild last year, I can’t wait for tomorrow! Like a kid at Christmas haha. Hope you had a good first day! !